Griffith Observatory is a space observatory, planetarium, and astronomy museum in Griffith Park with great views of downtown Los Angeles and the Hollywood Sign. 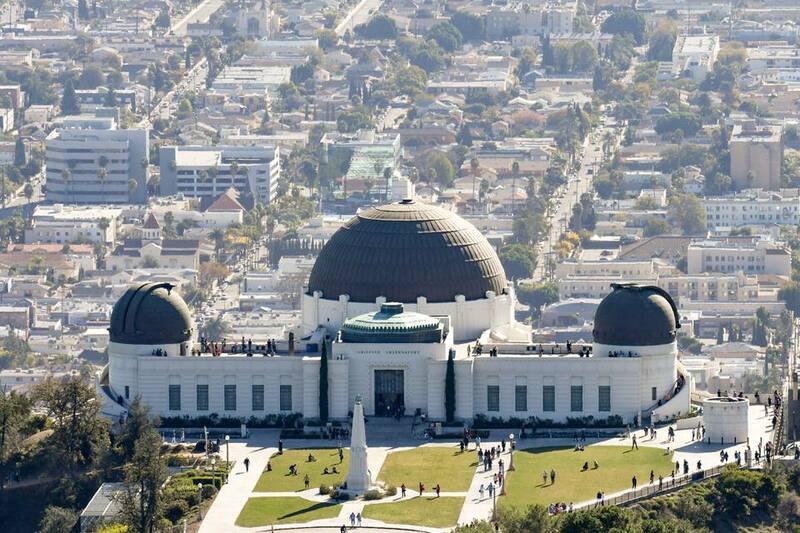 The observatory is one of the top free things to do in Los Angeles. In summer expect heavy traffic, especially when there is a concert at the Greek Theatre. Inbound Western Canyon Rd may close mid-afternoon. Shuttles no longer operate from the remote parking lots. On weekends, the Los Angeles Department of Transportation (LADOT) Observatory Shuttle runs from the Sunset and Vine Metro Red Line Station from 10 a.m. until 10 p.m. There is no parking near the Metro station. Back in 1882, Welsh immigrant and real estate baron Griffith J. Griffith bought up what was left of the Spanish land grant, Rancho Los Felis, named after its previous owner, Corporal Vincente Felis, (not the happy Feliz of today). In 1896, he turned around and donated 3,015 acres to the City of Los Angeles to create a grand park for the masses. That is the urban wilderness known today as Griffith Park. Griffith was inspired by a visit to a new research observatory built on Mt. Wilson in 1904 and decided to give the city an additional $100,000 to build an observatory on Mt. Hollywood in Griffith Park. This observatory would be owned and operated by the City of Los Angeles for the enlightenment and education of the public. The building's patron died 16 years before the building was completed. But eventually, the observatory that bears his name opened to the public in May 1935. The low prices during the depression and the assistance of a federal public works program allowed the Griffith Observatory to be built with top quality materials and extensive artwork. The Griffith Observatory was fitted with four permanent telescopes. A Zeiss Telescope with a 12-inch refractor allows for exceptional viewing of the night sky. Visitors can climb up to the east rooftop dome for a close-up look at the moon or planets, or they can view images from the telescope projected into an exhibit in the Hall of the Eye. Three solar telescopes are located in the West Rotunda. One offers a white light view of the sun; another shows a view through an H-alpha filter (spectrohelioscope), and the third shows a solar spectrum. Live images from these three telescopes are projected into exhibits in the Hall of the Sky. In 2002, the Griffith Observatory closed for a grand makeover that took until November 2006. From the outside, you see a new coat of paint, but very little change. The remodel was primarily underground. They dug out the hillside and created 40,000 square feet of new exhibit space, a new theater, gift shop, and café under the original building. The new exhibit space includes the Depths of Space Exhibit, a great hall with models of the planets and information that we have learned about them from space exploration. The Edge of Space Mezzanine presents objects from space that we have been able to study because they have fallen to earth, like meteors and comets. The Samuel Oschin Planetarium at the Griffith Observatory offers three shows. Centered in the Universe is a live-narrated, animated, and blinking-star-studded history of human's observation of the sky from Ptolemy to the present day. The Zeiss Universarium Mark IX star projector makes the journey more vibrant than ever. Water is Life leads viewers on a search for water—and possibly life—beyond Earth. Light of the Valkyries reveals the wonders of the northern lights. The Planetarium show is a separate ticket, which is not included in the free Griffith Observatory admission. Shows are offered every 60 to 90 minutes. The Planetarium show lasts about 30 minutes. Tickets are only available on site, so if you want to see the Planetarium show, be sure to get your tickets as soon as you arrive. There is no late entry to the Planetarium once the show starts. The Planetarium show is not recommended for children under 5 years old. Children under 5 will only be permitted at the first show of the day. There is a Planetarium Box Office to the left, just inside the front doors of the Observatory. You can also buy tickets with a credit card from automated ticket kiosks to the right of the Rotunda, across from the ladies room, or on the lower level between the Café and the Gift Shop. The Café at the End of the Universe is a cafeteria-style snack bar operated by Wolfgang Puck and commands one of the best views in L.A. Due to the view, it's one of the most romantic LA restaurants with a view—despite the plastic tables and chairs. The Charlie Parker Trailhead joins the Mt. Hollywood Trail at the edge of the Griffith Observatory parking lot and climbs higher onto Mt. Hollywood through landmarks such as the Berlin Forest, which is a tribute to L.A.'s sister city, to Dante's Peak and beyond. It intersects with the multiple other trails. The stretch from the Charlie Parker Trailhead to Berlin Forest where you can check out the view of the Hollywood Sign on a bench is just 0.3 mile on a mostly shady trail. The shade disappears as you go higher. 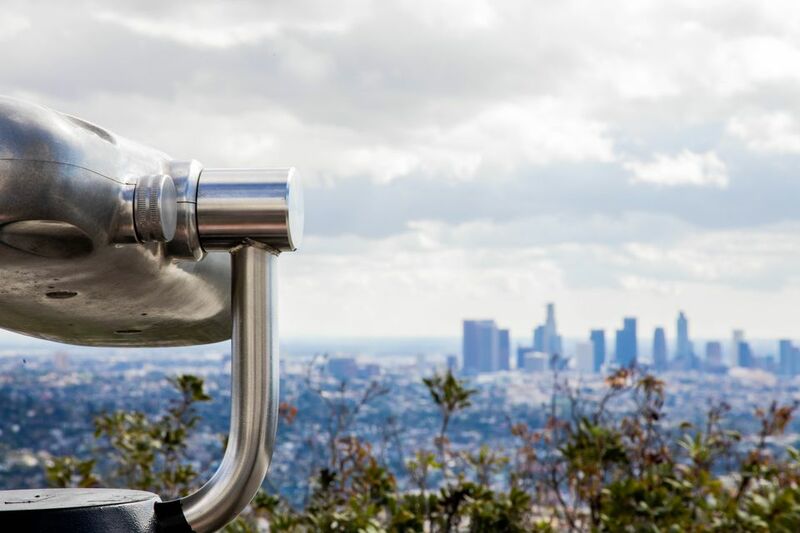 You can also hike in Griffith Park ​up to the Observatory on the West Griffith Observatory Trail, which is a fire road from the Fern Dell picnic area and Trails Cafe. It's a moderate 2-mile hike with a 580 foot gain. The East Observatory Trail is even shorter, but a bit steeper.